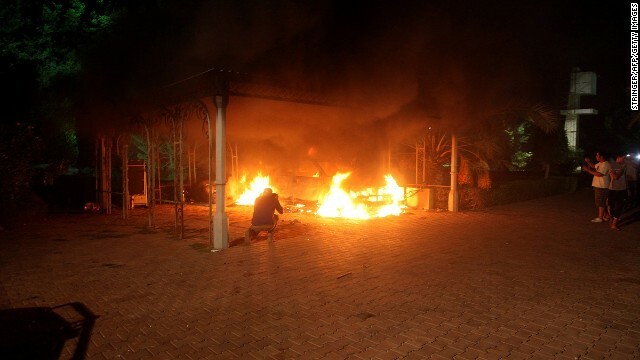 (CNN) - The House Armed Services Committee on Monday released hundreds of pages of transcripts of previously classified testimony about the September 11, 2012, attack on the U.S. diplomatic compound in Benghazi, Libya. The testimony focuses primarily on the military posture before, during, and after the attack, which left U.S. Ambassador to Libya Chris Stevens and three other Americans dead. In the testimony, senior military officials said that despite general warnings about the possibility of terrorist attacks around the world because of the anniversary of the September 11, 2001, terrorist attacks, there were no discussions related to any specific threat in Libya. As a result, additional military assets were not deployed.Chairman of the Joint Chiefs of Staff Gen. Martin Dempsey testified that he did not recall Libya coming up in a conference call with President Barack Obama and his national security advisers on the eve of 9/11 to discuss "threat streams related to the 9/11 anniversary." Maj. Gen. Darryl Roberson, vice director of operations for the Joint Chiefs of Staff, testified that an analysis of how many attacks the U.S. has had on the anniversary of the 9/11 attacks since 2001 found "the answer is one, and it was September 11 of 2012. Prior to that event at Benghazi, there had not been an attack on 9/11 that DOD had to respond to in any way. So we were taking in all of the indications and warning. We were postured as appropriately as we can be and we thought we should be around the world." Gen. Carter Ham, who headed U.S. Forces Africa at the time of the Benghazi attack, testified he stood by previous comments he made about not recommending "deployment of any additional U.S. military forces to Libya due to the threat environment." He said that while the security situation was deteriorating in Benghazi, he did not have "specific indications of an imminent threat." Despite that, Ham and others did raise the idea that the presence of Defense Department protection of diplomatic personnel in Libya - specifically of a team known as a "Site Security Team" could have made a difference in protecting Stevens on the night of the attack. Ham testified that Stevens decided not to extend the deployment of that team beyond August 2012. So they were not present when the Benghazi attack occurred. Ham also testified about his growing concern that eastern Libya was becoming a hotbed of extremism and that he had advocated for more intelligence assets to gain a better understanding of the extremist groups on the ground. Ham said then-Secretary of Defense Leon Panetta had approved the use of predator drones in the area, but Ham felt he could have used more military assets. "I don't know that I would go so far to say that it would have prevented the attacks that occurred on September 11th," Ham said. "But it won't surprise you that as a military commander, you know, I wanted more resources. And the resource that I felt I needed most was additional intelligence, surveillance, and reconnaissance to gain a better understanding of what was happening." Officials testified that in the wake of the Benghazi attacks, U.S. military assets are better positioned to respond in the event of another attack on a far-flung U.S. diplomatic compound. Dempsey also revealed that the U.S. military is not authorized to kill any suspects believed involved in the Benghazi attack - meaning they would instead have to capture them. U.S. authorities have filed charges against Ahmed Khattalah, leader of a Libyan militia that officials believe was involved in the assault, people briefed on the investigation have previously told CNN. The charges are under seal. What are epic fail this was our lame duck president did nothing . Thank God the clown is not in the White House anymore . Where are the hundreds of photos of Obungole leading the defense of Benghazi? I stopped watching CNN and only check this online news site to cross compare news stories. CNN is obviously lib oriented and while this is not bad, it is disappointing to this news junkie. The article referenced herein is awful reporting ... period. Your headline reads more unclassified details revealed about Benghazi attack, only CNN forgot to write the details. CNN cherry picked the information on the Benghazi attack to make it sound as though there was no imminent threat for our U.S. Ambassador Steven and the other 4 heroes, really, on the anniversary of Sept. 11. 2012. It's no wonder why CNN is slipping in the cable news ratings, along with its credibility reporting news. This is just B. S. CNN burying this story! However look at the coverage of Chris Chirsty…. I bet I get moderated as I always do for disagreeing with the propaganda from CNN. So our military is admitting its gross incompetence regarding the inaction in Libya. Why? Who should be replaced so as to restore competence? Here is a hypothesis: The President knew within hours that the attack on Benghazi was a planned and orchestrated terrorist attack. He chose, because he was in the heat of an election, to go with the suggestion that it was a "spontaneous" demonstration which was an" act of terror". He was not forthcoming with what he knew about the real situation in Benghazi. He made insinuations to try and persuade the public view of the situation. It worked. He won the election. A means to an end. Now, the truth is beginning to come out at what cost to the President? Some call him a liar. Others think he got more information that changed his perspective. The information coming out from this week's news is that the President knew on day one that it was NOT a "spontaneous" demonstration. In this hypothesis, I personally think President Obama's intent was deception due to the election. The stakes were high. I then have to say our President has an integrity problem. Some people can live with that. Should a President be a man of integrity. . . all of the time . . . or just some of the time? Is it a matter of when it is convenient? Does it matter to you? Do means justify the ends. I don't think they should. If we start down that road, what will it lead to. Honesty is the best policy. You make a valid argument. My quarrel with the video story is that if Obama had told the truth it would be the one time he has been proven to have told the truth. You only need to be caught once in a lie to lose credibility. But you can do almost everything right and not gain that trust again. He is a consummate liar. Over at Fox News there are 5,000 plus comments on this topic. Here there are only 7. What is wrong with this picture? Really good things are being discussed on Fox News comment pages. Discussion from all points of view. Define an "act of terror" (which are the President's words in describing Benghazi) and "an act of terrorism". Murder is an act of terror. In the Rose Garden President Obama also allude to this being about the video and religion. Acts of terrorism are planned and orchestrated. Act of terror is different in my mind. "Since our founding, the United States has been a nation that respects all faiths. We reject all efforts to denigrate the religious beliefs of others. But there is absolutely no justification to this type of senseless violence. None. The world must stand together to unequivocally reject these brutal acts." @thinkingitthrou An act of terror results from terrorism. @poptech @thinkingitthrou This is true, but the President should have called it an "act of terrorism" to give it the firm representation it needed. It feels to me that President Obama was trying to call the "demonstrations" acts of terror which were suppose to be "spontaneous". @thinkingitthrou That is a bit of an over-analysis, but OK.
@thinkingitthrou@poptechkeep trying....bush called his 9/11 an act of terror 2 days after the attack. Mage will you give me the link to this so I can see it in context. In context always helps me to understand. That is why I am posting so much of the actual speeches and such. Thank you. "terror attack" in reference to terrorist groups but I needed to hear the President officially say Benghazi was a terrorist attack. Maybe that is just me, but it would have helped tremendously in this quagmire. Obama and his administration have repeatedly lied about this attack to support his reelection. They also have repeatedly lied about using the IRS to suppress the conservative vote. These are facts. Yet, the mainstream media, including CNN choose not to investigate these cases and perform their journalistic duty because they are Liberal Democrats and thus choose to support the lies to further their cause. This irresponsible behevior will lead our country to a great downfall and possibly civil war. You seem to be right about CNN. Wish it were different. CHILDREN OF NICOLAS MADURO TECHNOLOGIES USING SATELLITE PROGRAM FOR WOMEN. PEN AND TELLER HELP US. TRANSGENIC CORN BULLSHAT ITS NANOTECNOLOGY IN CHOCALATE. HIJOS DE NICOLAS MADURO USANDO TECNOLOGÍAS SATELITALES PARA PROGRAMAR MUJERES. SALEN CON MODELOS Y LAS VIOLAN. WOW! Check out FOX.COM to get a totally different story on this release of transcripts. CNN seems to ignore some damning information related to a cover up of what really happened before the presidential election. Someone needs to hold this administration responsible for all the lies. and apparently CNN doesn't have the stomach for it. SHAME ON YOU CNN! Why don't you print the whole story and transcript. Panetta knew by his commanders on 9/11 that this was a terrorist attack, how did the video story circulate two weeks after? Was it aother lie to insure the election of the President? The media should tell the whole truth, not half-truths. I guess since this is buried under Hillary stories it's just another "phony scandal." Not much help to the conversation but thanks for trying. Have a good day. You need to stay on your meds buddy. You are rambling incoherently. And you sound like a moron.